It's day two of Propellerhead Software's five-day "roll-out" of the new features of Reason 5 and Record 1.5, and today they're giving us a glimpse of Blocks, a sequencing system that'll be common to both apps. The basic idea is that you define sections of music (eg, Intro, Verse, Chorus) known as Blocks, then switch to Song mode to arrange them. 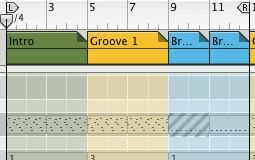 The concept is similar to Cubase's Arranger Track, but differs in that you can see the structure of the song in the arrange page. There are also some neat tricks such as being able to mute individual tracks in a Block, which could be used to, say, mute a synth part during the first verse. As new features go, this one looks like it'll fall into the "welcome addition" category rather than being a mindblowing game-changer, but with three days' worth of revelations still to come, we assume that the Props are saving the best till last. The release dates of Reason 5 and Record 1.5 remain unconfirmed - if you simply can't wait, why not sign up for beta testing?